Allows you to print from almost anywhere using a laptop, iOS device, or Android™ device. The easy-to-use, 24-inch HP DesignJet T120 gives you more for your money—including Web connectivity, which could allow you to print from almost anywhere using a laptop, iOS device, or Android™ device. The intuitive, full-color, touch-screen simplifies navigation and printing. 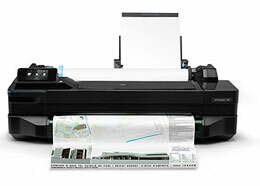 Don't buy HP DesignJet T120 without contacting Napco. Call us today at 1-866-752-6766.